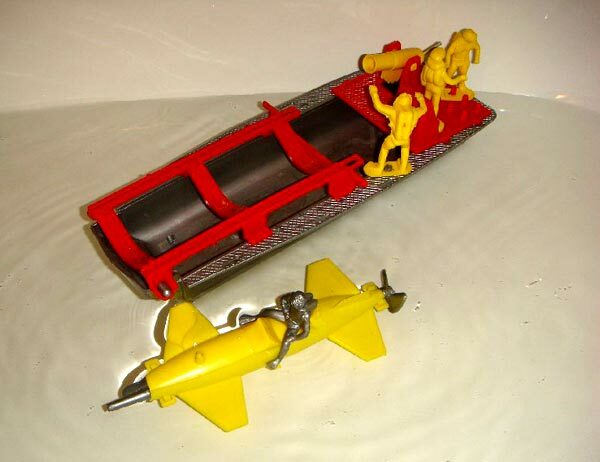 In Issue 45 we have a story about the Ideal Frogman Sub Launcher. What a great piece. 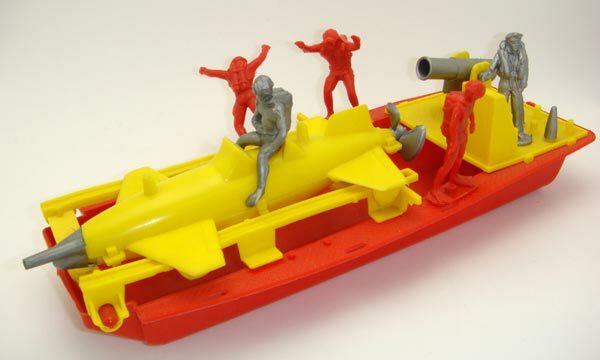 But kids often over-torqued the rubber band powered submarine to the point the thing broke, with propeller spinning lifelessly at one end and the crank useless at the other. That's the way they are all too often found these days. 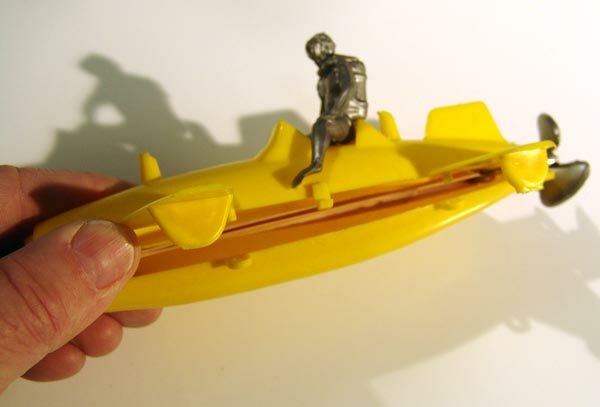 For our little demonstration in the issue, we wound our original rubber band powered sub up several times to test it. Unfortunately, we too broke it and had to go through a repair. Maybe you have one that's in need of a new rubber band also -- here's how to fix it. Notice along the side there are some clasps where the top of the sub's hull meets and is secured by the bottom half. Separate these. 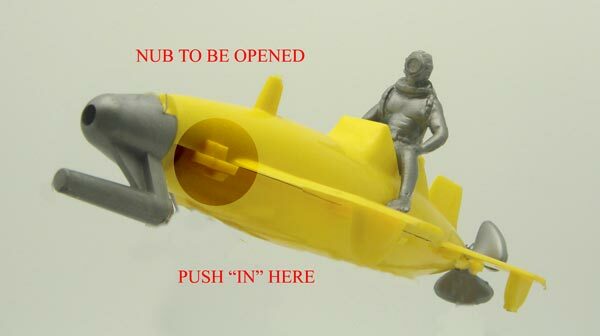 Try using a small blunt object (we have old dental tools for toy repair which our dentist happily bequeathed to us) to "push" the nub up and out of its lock. Even after forty some years, our sub was still pliable and separated without damage. If your sub seem brittle, or like it might break, stop and do not proceed. 1) Now the sub will hinge open as shown. You will leave the two halves of the sub in this position until the repair is complete. 2) The forward crank (in silver) and the propeller piece are separate. You need to remove them. 3) Thread a new rubber band through the loop on the crank section. Push it just far enough so it forms a "loop". Feed in one end and thread the remainder through the loop. 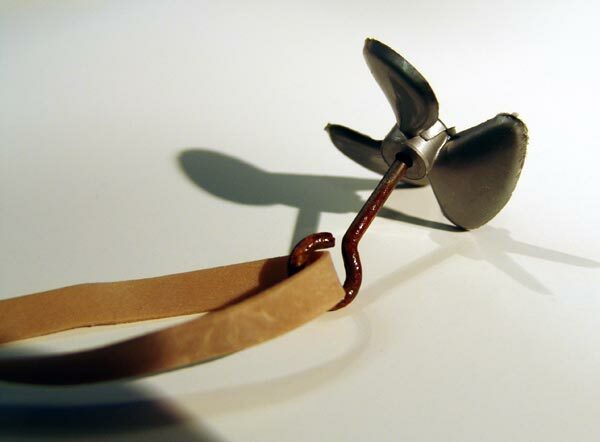 4) Now hook the other end to the propeller. The propeller is equipped with a real nice molded piece just for this purpose. 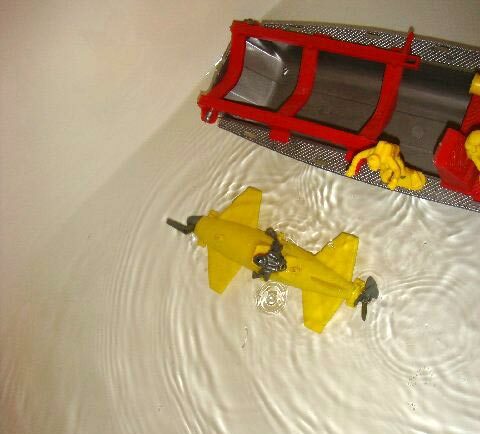 5) finally, return the entire propeller assembly to their places in the sub. There should be some stretch to the rubber band causing the crank and propeller to fit snugly in their places. Snap the hull closed and wind 'er up -- you're good to go!